The Latin word for this group of maples –pseudoplatanus, translates as False Plane Tree, I guess since the leaves resemble those of the common Plane Tree (who is in charge of this stuff?) The common name actually comes from the Esk Valley in New Zealand, and someone, I guess, changed the spelling to Eskimo (again, who is in charge of this stuff?) Eskimo Sunset is a stunning new introduction, with incredible leaf colour. 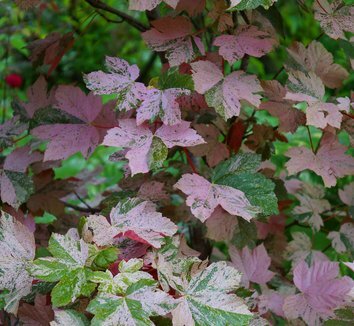 Leaves emerge a radiant pink, transforming to a mottled blend of cream, dark and light green and pink. The tree has a very attractive oval form and its small stature will allow it to be planted in smaller urban gardens. It will grow to 12’ to 15’ and should be planted where it gets a bit of afternoon shade to prevent leaf scorch. Eskimo Sunset is deciduous and the fall colour are an unusual velvety brown, and the truck has a nicely textured gray bark. It should not require much pruning to keep it in shape, but if you need to do any remedial pruning I would suggest you do it in late summer to avoid excess loss of sap. If you have the right spot I highly recommend this hardy dwarf maple, which should do very well in our Kootenay gardens.